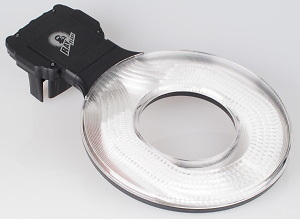 We review the Rogue Flashbender 2 flash modifiers. With a number of options, we look at the Bounce Card, Small Soft Box and Large Soft Box Kits. We test the RayFlash Universal RingFlash Adapter - designed to give any flash head a ring flash effect. Wing Light is a portable flash modifier with wings. We see if it's going to fly. The Phottix Soft Flash Diffuser is a simple flash diffuser for use with any camera flash. 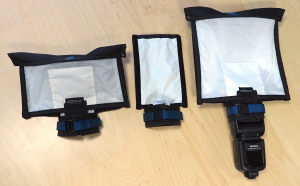 The Lastolite Ezybox Speed-Lite is a softbox for portable flash. A review of the Lastolite Hotrod Strip Softbox designed for portable flash guns. Lastolite Strobo is a portable flash modifier kit with honeycomb grids, masks and coloured filter gels. Here we see how it performs in the studio. The Rogue 3-in-1 Honeycomb Grid is a compact flash modifier for portable flash. We see how it performs. We look at the new Collapsible Lightsphere from Gary Fong. Dedicated ring-flash can be expensive so an adapter that yields the same results is a suitable alternative. Here we test one such adapter from Phottix. Expanding the creativity of your lighting, the Honl Photo lighting accessories attach to a hand-held flash gun.